We belong to Christ, not ourselves. We are a Catholic faith community that seeks to place God first, to know him, and to grow in holiness together. We strive to live the Gospel through the Eucharist, in our teaching, and way of life. 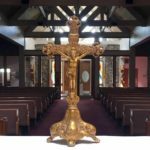 All take place at St. Columban Church in Yelm unless otherwise noted. 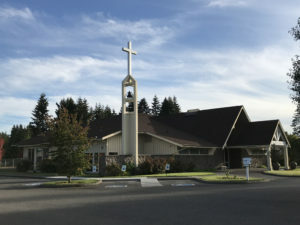 The Roman Catholic Church in our area gathers together at both St. Columban Parish in Yelm and St. Peter Mission in Tenino to minister to the communities of McKenna, Nisqually, Rainier, Roy, Tenino, and Yelm in southeast Thurston and southwest Pierce counties. Our community has grown since its origins at the former St. Margaret Mary Church in McKenna. Our current church, named for the Irish-born 6th century missionary to Europe Saint Columbanus, was dedicated in 1992. All are welcome to attend classes. Share your gifts with the community by becoming involved in our many volunteer opportunities. Please fill out a downloadable registration form and turn-in to the parish office. If you have a child that you wish to attend our Faith Formation programs for Grades K -5 (Children's Ministry) or Grades 6-12 (Youth Ministry) please complete this form to register and turn-in to the parish office. Forms may also be emailed, however we may need to contact you to verify information. We have fundraisers, breakfasts, and dinners offered throughout the year. We are a Catholic faith community that seeks to place God first, to know Him, and to grow in holiness together. We strive to live the Gospel though the Eucharist, in our teaching, and way of life.